As the Term draws to a close, I congratulate our students for starting out the year in such a fine manner. There is such a positive energy around the school and I look forward to a great year ahead. I am pleased with the way the community has embraced the new House System and the modifications to the timetable in both the Junior and Senior School. 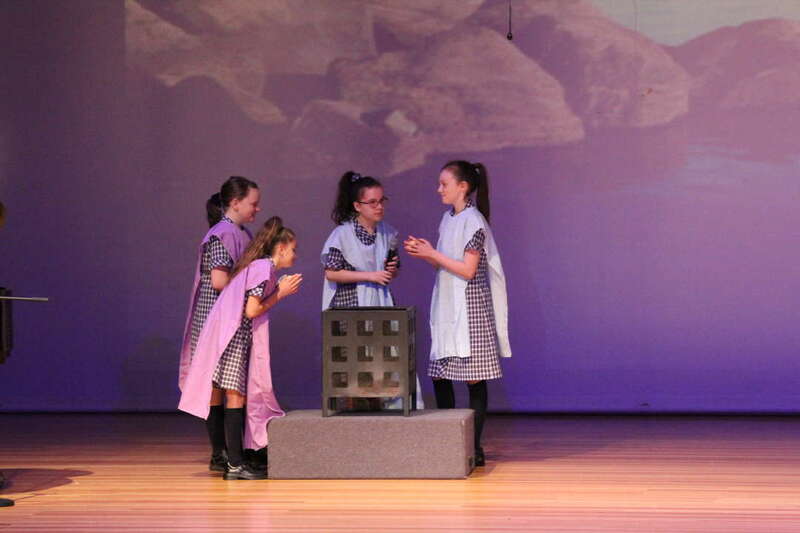 I believe the vertical House structure has given our students the opportunity to cultivate friendships, goodwill and camaraderie, whilst developing a spirit of cooperation, courtesy and consideration toward others. At times it is good to put ourselves outside our comfort zone in a safe and structured environment in order to meet others and share our wonderful Casey Grammar experiences. Since the beginning of the year, we have focused on wearing both the School and House uniform with pride, and I have been extremely pleased with our students taking this on board. I ask all students and parents to maintain this pride as we transition to wearing the winter uniform next Term, whether it be when stepping out of the car in the morning or getting onto the bus of an afternoon. I also ask students to be aware of expectations regarding hair and grooming; and to continue to think about how we treat those around us. 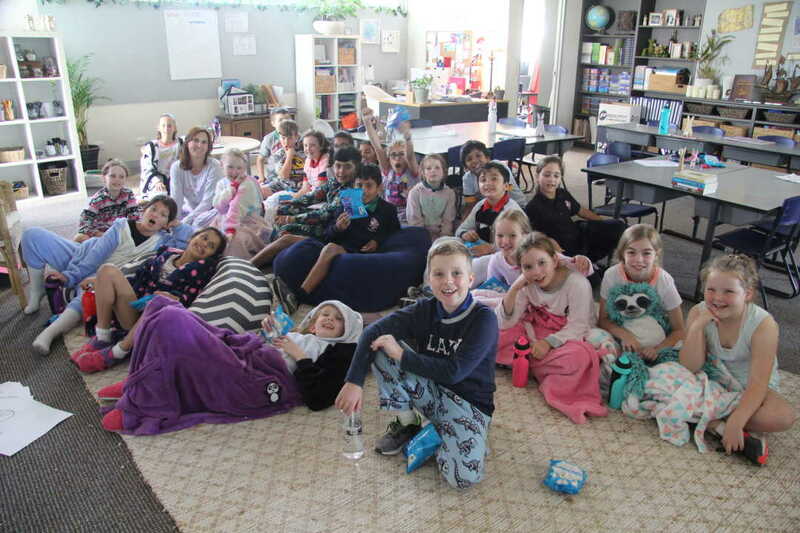 - Junior School “Trist House” Pyjama Day Fundraiser for the Royal Children’s Hospital Good Friday Appeal. I’m very grateful for the service and dedication that Mrs Elvish, Mrs Sparrius and Miss Tsoukalas have brought to the Casey Grammar community and I know you’ll join me in wishing them all the very best for their future endeavours. Mr Anthony Brown will be taking long service leave for the duration of Term 2. I wish Anthony safe travels as he sets off around Australia with his family. In Anthony’s absence, Mr Ryan Subban will step into the role of Head of Reid House (Senior School) and we will have a new teacher join us, Miss Jess Delgos, who will be the replacement teacher for Mr Brown’s classes. In the Junior School we will welcome two new Learning Assistants who will work from 8:30am to 1:30pm Monday to Friday. Enjoy the break and I look forward to seeing our students and their families return for Term 2. It is difficult to believe that we have come to the end of Term 1 already. The past ten weeks seemed to have flown by and yet we have accomplished so much in the Junior School in that time. Schools really are incredibly busy places of learning and CGS is certainly no exception. Recently we had the privilege of attending two fabulous class Assemblies. First up was 1P and we were thoroughly entertained by the students who enjoyed playing the characters in the Eric Carle story 'The Bad Tempered Ladybird'. Throughout their performance, the students acted out and explained how important it is to treat others with respect. At the end of the play, the Bad-Tempered Ladybird learnt a very important message about sharing. To end the Assembly off with a bang, the students helped to create a Hip Hop routine where they had to move and dance as a whole group. This displayed dedication and great team working skills. Congratulations to Miss Papettas and her wonderful class! 5N students put on a dazzling show that was all about the importance of reading which included a colourful, well-choreographed dance number, a song and a play that demonstrated the reading strategy of inferencing. Bravo Miss Nolan and your talented students who very ably demonstrated the power of ‘A show must go on’. We were all so very proud of you! 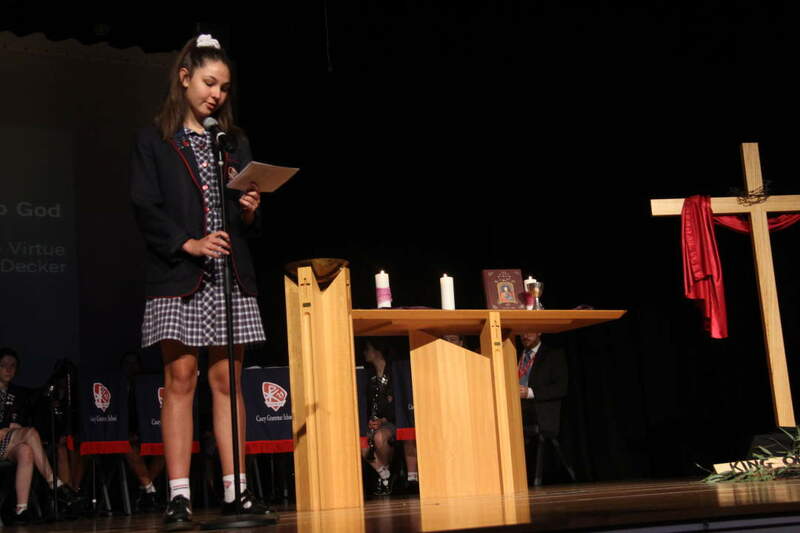 Yesterday our Junior School students attended our annual Easter Chapel Service. I would like to thank Mrs Rivière-Pendle and all our students who prepared and performed at this special event. I’m sure all our students gained added perspective about the real value of Easter. Last week I attended our Regional Swimming Carnival at MSAC with four of our Year 6 students; Charvi Shetty, Julia Stipkovic, Cassandra Sutcliffe and Sarah Stephens. It was an incredible achievement simply to qualify for this high standard competition. The girls all swam incredibly well and I couldn’t have been prouder of their efforts. Each race was represented by ten schools and the standard was extremely high with many State swimmers in attendance. Julia placed 3rd in her Butterfly event, Charvi 5th in her Butterfly event, Julia 5th in her Freestyle, Charvi 7th in her Backstroke and the four girls took home 7th place in a hard-fought Freestyle Relay. 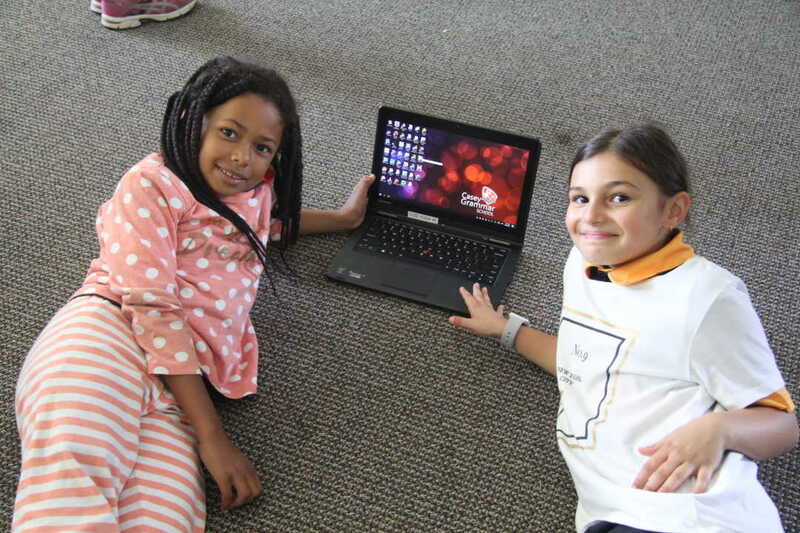 Last Thursday, our Year 3 and Year 5 students, along with students from all over the country, completed a NAPLAN Practice Test to familiarise themselves with the new 2019 online format. I must say that due to the students’ high computer literacy skills, they all handled the sessions well. NAPLAN testing will take place next term in May and while it’s only a snapshot of our students’ learning, it is a valuable assessment tool for our teachers. 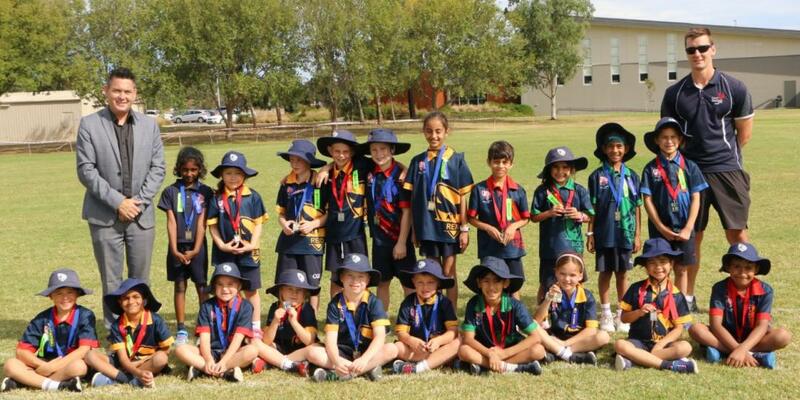 On Wednesday we held our Year 1 & 2 Athletics Carnival and much fun was had by all. Thank you to Mr Batey for everything he did to ensure the day ran successfully and our ever supportive parent body for coming along to support your children. Congratulations to our Champion and Runner Up Champions! Finally, I’d like to wish our students, their families and our dedicated staff a most well deserved break and Easter celebration. I look forward to warmly welcoming our 400 students back to school on Wednesday 24 April. 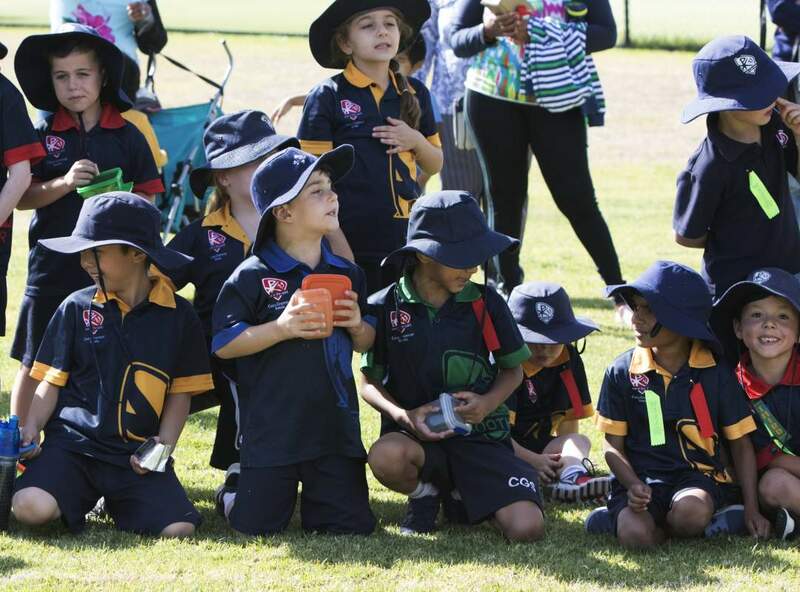 The weather was perfect for the Year 1 & 2 Athletics Carnival this week. The students had lots of fun and participated with enthusiasm during their events, with plenty of cheering and supporting of one another. It was great to see so many parents and guests in attendance encouraging the students and even participating! The teacher versus student relay that followed was lots of fun. It is clear however, that the teachers’ pre-carnival training is going to need reviewing next year, being beaten convincingly by the student teams. Thank-you to the teachers, learning assistants and Year 6 student helpers for running the events, to the parents and friends who attended and to the PFC for the sausage sizzle that followed. It was also a big week last week for four of our Year 6 students, who participated at the Regional Swimming Competition at Melbourne Sports and Aquatic Centre. The relay team consisting of Charvi Shetty, Julia Stipkovic, Cassandra Sutcliffe and Sarah Stephens progressed through to this level after winning the 4 x 100 metre event convincingly at Divisional swimming earlier in the Term. The girls swam a great race against tough competition to finish 7th. 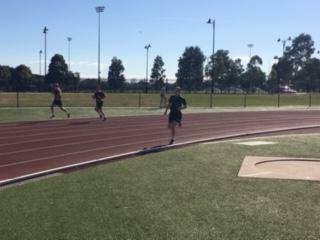 Julia and Charvi also competed in individual 50 metre events. Julia finished 5th in freestyle and 3rd in butterfly, with Charvi finishing 7th in backstroke and 5th in freestyle. Well done girls! 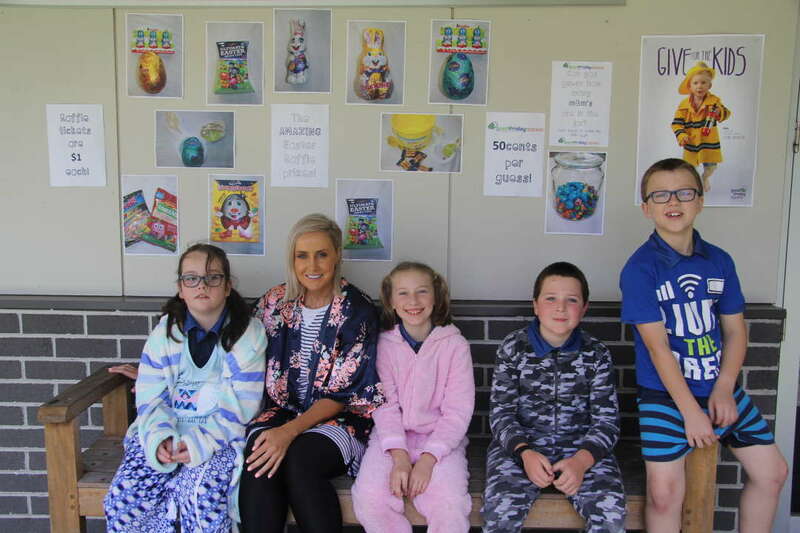 This year the Junior School Trist House annual fundraiser is raising money for the Royal Children's Hospital Good Friday Appeal. The Royal Children’s Hospital is amazing! It provides care for thousands of children and their families across Australia. The Good Friday Appeal raises money for equipment, research and education to help this very special hospital. Today the Junior School students dressed up in their pyjamas as if they were in the hospital like the many patients of the Royal Children’s Hospital. 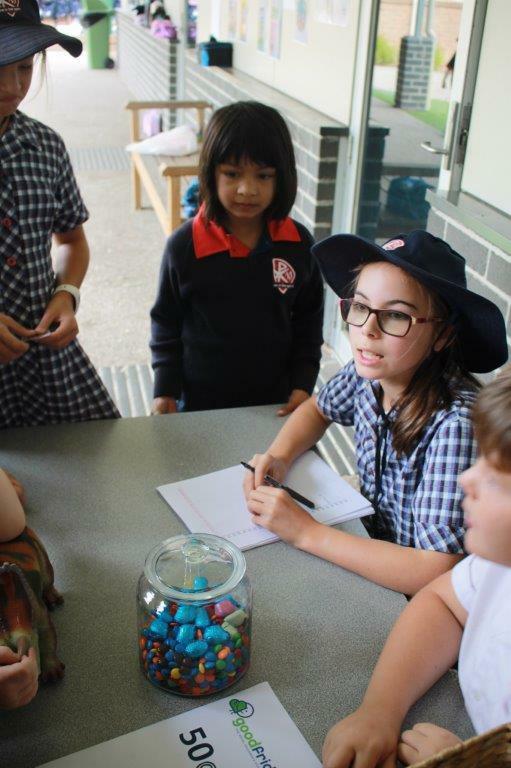 We have also held a guessing competition where students can guess how many M&Ms are in the jar. The lucky winner will win the jar; the other two closest guesses will win a prize too! Last but not least, we have been running an Easter Raffle with 12 prizes to be won! Congratulations to the winners! We will update you next term with the total amount raised. Thank you for support and have a Happy Easter! The students in 5D have been learning about Cubism in their Art lessons, specifically the work of Picasso. They explored the concept of creating a portrait, with two faces merged; one side profile, and one front-facing. 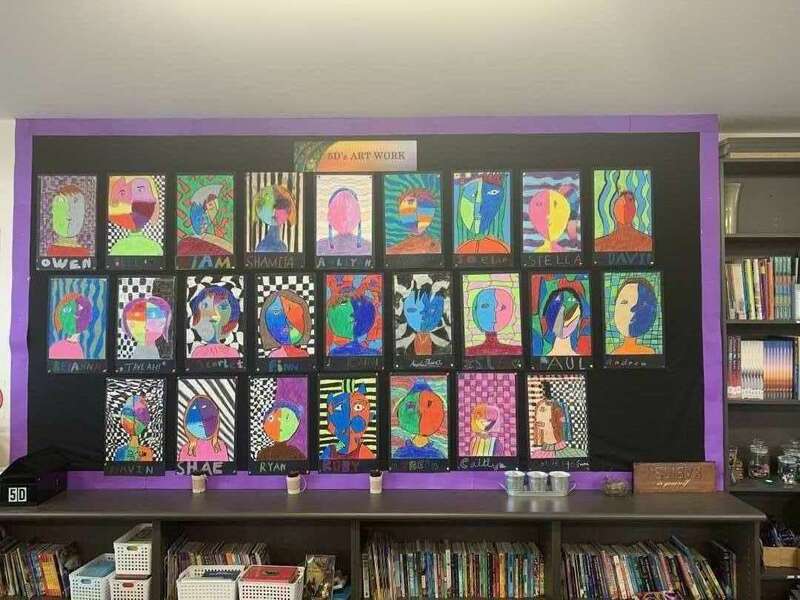 Pastels were used to complete their art piece, creating a vivid, eye-catching final product. 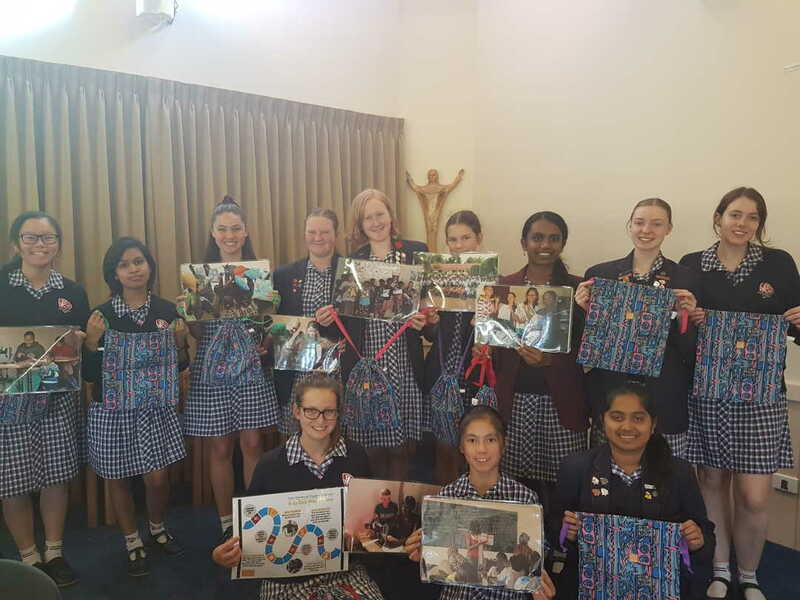 As Term 1 winds to a close, it is clear to see that the students of Senior School have made enormous progress in both their studies and in their involvement in co-curricular activities. I commend them for their engagement and contributions and encourage all to continue to be active members of the school community. Casey Grammar students have the opportunity to participate in the Duke of Edinburgh Award commencing in Year 9. The Duke of Edinburgh Award challenges young people to set goals and demonstrate self-improvement by; learning a new skill, improving their physical well-being, volunteering in their community and experiencing a team adventure in a new environment. This week we proudly presented the Bronze Duke of Edinburgh Awards to Alastair McKearney and Ellen Streat. Congratulations to Alastair and Ellen and their Duke of Ed teacher Ms Angela O’Driscoll. We look forward to following Alastair and Ellen’s progress as they take up the challenges of the Silver Award. A new feature in our Senior School Assemblies are the Connor Raselli Interviews. Last week Connor interviewed sisters Bridie (Year 10) and Kaylee Forster (Year 8) about their Irish dancing. The girls talked about how they became Irish dancers and the various competitions they have participated in around Australia. They then delighted the audience with a toe-tapping dance demonstration. Thanks Bridie, Kaylee and Connor. This year we joined the Southern Independent Schools (SIS) organisation who provide a range of sporting and cultural activities and friendly competition between Schools. 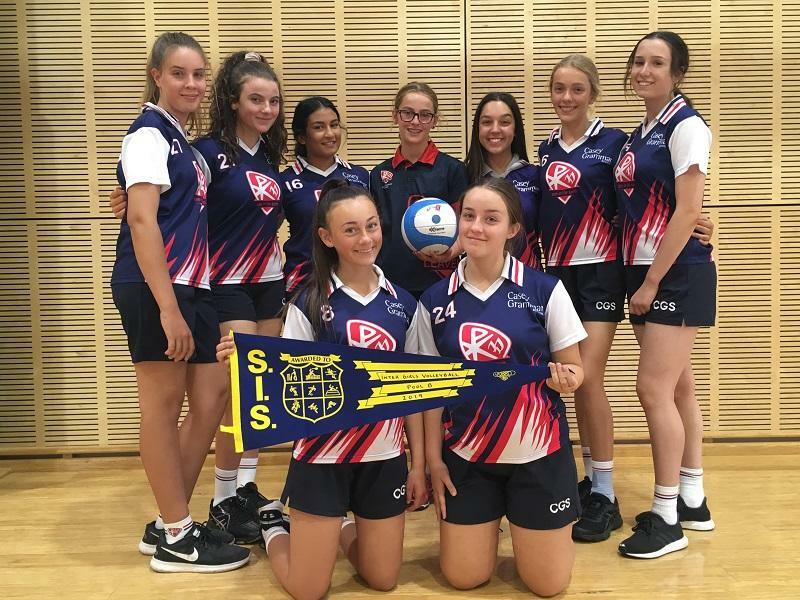 This term Senior students (Year 11 and 12) competed in girls Basketball and boys Soccer while the Intermediate students (Year 9 and 10) played boys Indoor Cricket and girls Volleyball. While all teams were very competitive and had a good chance of winning the flag, it is with great pleasure we can announce that both Intermediate teams won pennants. Congratulations to the Volleyball and indoor Cricket teams on their success and to all students who made the commitment to training and playing in the various teams. I know your coaches are very proud of your sportsmanship and team camaraderie. Special thanks to the teachers who gave their time to coach the teams; Mrs Emma Garby, Mr Anthony Brown, Mr Richard Baird and Mr Aaron Bushell. Last week SIS also organised a musical extravaganza called the Big Night. 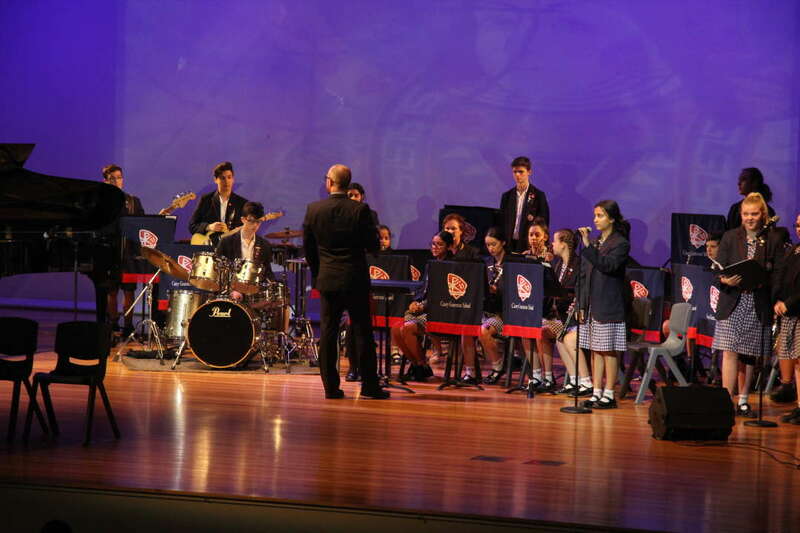 The Casey Grammar School Concert Band were invited to play the opening number for the evening. 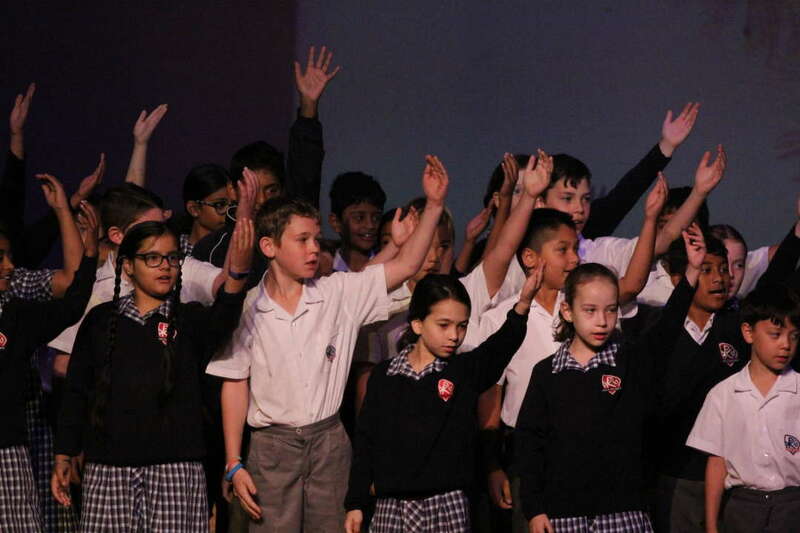 Their performance of Skyfall by Adele was a real crowd pleaser and we were lucky enough to have an encore performance at School Assembly the following day. Congratulations to the Head of Music Mr Stuart Collidge, his wonderful music teaching staff and Casey Grammar School musicians. As the term draws to a close, we have said farewell to Mr Anthony Brown who is spending his long service leave on a family road trip travelling around Australia. Mr Brown will return in Term 3. We have also said a very sad goodbye to our School Counsellor Miss Dimitra Tsoukalas who has been an integral part of the school community for the past two years. Miss Tsoukalas has taken a position closer to home, and we wish her all the best in this new chapter in her career. The staff and students are also very sad to be saying goodbye to our Careers Counsellor Mrs Marita Elvish. Mrs Elvish has served the Casey Grammar School community for the past 11 years. There are generations of students who are indebted to her for her wise careers counsel and her exemplary teaching. Mrs Elvish has taken a leading teacher role and is looking forward to the challenges of leading a large team in her new school. We will miss her very much. Parents are reminded that Parent Teacher Student Interviews will be held in Senior School on 30 April 3:30pm – 8:00pm and 7 May 3:30pm - 7:00pm. Bookings will open next term. Please pencil these dates into your diary. On behalf of the staff of Senior School, I wish you and your family a relaxing and happy school holiday and a wonderful Easter together. Enjoy. Congratulations to Aisha Canlas, Teah Dorman and Layla Hargreaves who just scored their first win at last weeks round 2 debates. Teah was awarded best speaker. 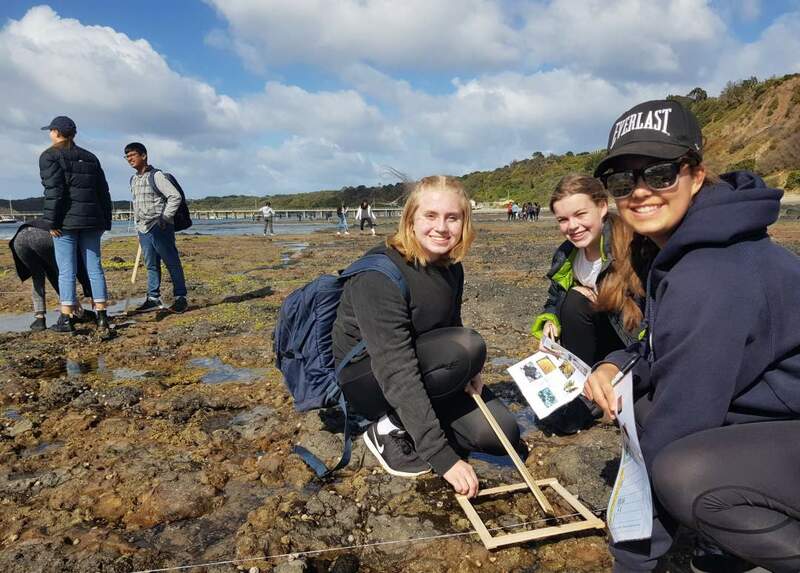 On the last Monday of March, the entire Year 9 cohort undertook a field survey of Mushroom Reef, at Flinders, where they systematically combed a very old, basalt slab for the myriad of invertebrates that make it their home. Students worked in groups to study the numbers and types of organisms found along a series of 50 metre transects of the rock platform, recording information at 2-metre intervals. Later, the class data were combined to obtain a more reliable measure of the zonation patterns that exist on the reef. It is hoped that through a number of successive visits over a few years, Casey Grammar students will gain a deeper understanding of the complexities of the ever-changing habitat of the rocky shore. Once again, Pi Day was celebrated at Casey Grammar School on this special day for Mathematicians. Put simply, Pi (π) can be calculated by dividing the circumference of a circle by its diameter and is often rounded off to 3.14. That is why the 14th day of the 3rd month is called Pi day. In actual fact, Pi is a non-recurring infinite decimal that is now well known to trillions of decimal places thanks to advancements in computing power. On Pi Day this year we had our usual competition to see who could remember Pi to the most decimal places. Thank you to all students who participated and to the entire Maths Staff who assisted during lunchtime. Congratulations to Devarsh Patel of Year 8 who broke the school record by remembering Pi to 150 decimal places. Second place goes to Anmol Singh of Year 11 who recited Pi to 100 decimal places. Third place goes to Jay Rambrichh of Year 7 who remembered Pi to 72 decimal places; a terrific effort. There were over 200 entrants and the top place getters are listed below. Also special congratulations to Zoe Kleverlaan for winning the competition for guessing the circumference of the circle. The actual answer was 242cm and Zoe guessed 240cm. The School Strike 4 Climate was originally started by one lone, fourteen-year-old activist- Greta Thunberg in August 2018. From one girl, passionately concerned with the rapidly deteriorating state of our world sitting outside the Swedish Riksdag (parliament), an entire movement was born. On March 15 2019, school strikes urging adults to take responsibility and stop climate change began taking place in over 2,000 cities world worldwide. The purpose of the School Strike for Climate change is essentially to place pressure on governments to enact real change in regards to the creation of government policies that have a holistic approach and consideration of the environment and the detrimental effects that humans have upon it. Of course, individual changes are needed to reduce the effects of our climate changing, such as refusing single use plastics, driving less and genuinely protecting natural environments and their countless inhabitants. But in accordance to this, we need governments to truly stand up, because one piece of legislation could create a significant amount of change in a fraction of the time. And we need to be as time effective as possible, because at best, we have 12 years before the effects of climate change become completely irreversible. 71% of carbon emissions are attributable to just 100 companies in the world. So, as you can imagine it’s a bit disheartening trying to walk where we can, or get public transport or refuse single use plastics, and lead the lives we know have a lesser impact on this Earth, when government could eradicate more than half the world’s emissions by a simple act of legislation that could cap company emissions. Ultimately, this world is not coping and our actions need to be engaged to protect it, not create further harm. Earth is our unanimous home, and every life upon it, including us, depends entirely on its existence. We went to the ‘School Strike 4 Climate’ because in our opinion the people in power are not taking action. The consequences of such indifference towards our beautiful planet will cause unmitigated disaster, and it will be our generation that suffers from the consequences. There is never a dull moment in a school, and this fortnight has been no different! 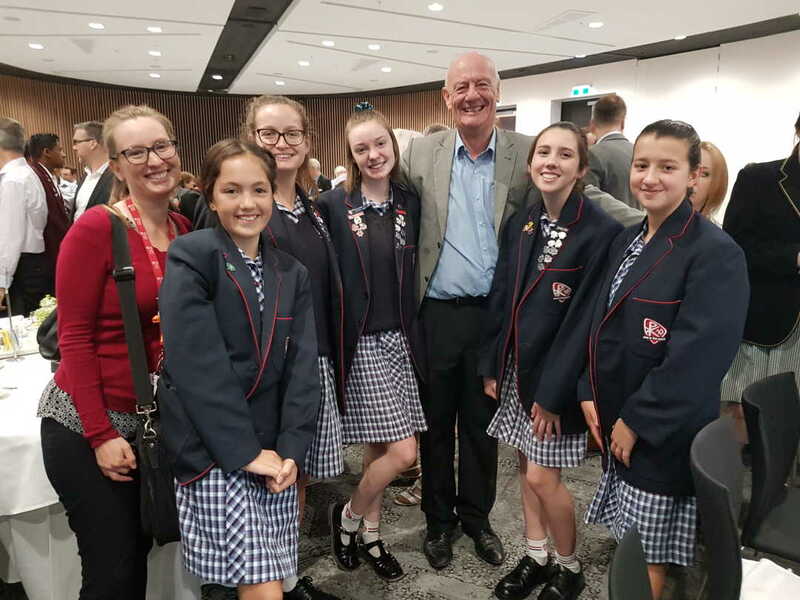 Casey Prayer BreakfastFive students from Year 7 – 12 got up bright and early to meet at Bunjil Place for the inaugural Casey Prayer Breakfast, featuring Tim Costello. We enjoyed a hearty meal, heard some excellent harmonies and an important message about acceptance. This is particularly powerful in the context of living in our unique city council; where we have 120 different faiths represented, the highest number of Indigenous Australians in metropolitan Melbourne, one of the highest number of refugees and an incredible range of racial backgrounds. We live in a diverse and exciting council, which presents both challenges and great opportunities for us all. The students appreciated finishing off the breakfast by having a photo with our speaker. This week we celebrated the amazing story of Jesus’ birth, death and resurrection within the school. Earlier this term we began Lent with Pancake Day and our conclusion was the Easter services. My sincere thanks to the Year 7 - 12 students involved in the Senior service including the readers, prop assistants and our wonderful school band. The Junior Service was made richer for the work of our Year 3 - 4 Choir, Show Choir, the Year 6 students who lead us, as well as our enthusiastic ‘flash mob’ of Year 1 & 2 students. It would be impossible for me to organise these services without the support and assistance of many staff including Mr Hall, Mr Collidge, Ms McAllister, Mrs Kyne and our Junior School RE teacher, Mrs Grant. It definitely is a team effort. As a school with Christian foundations, it means so much to be able to share in these significant religious occasions together. Backpacks 4 Vic Kids Holiday Clean up excursion Friday 12 April (members of Social Justice Group. God bless you as we lead into Easter. May you enjoy a restful, relaxing holiday with your family and friends. 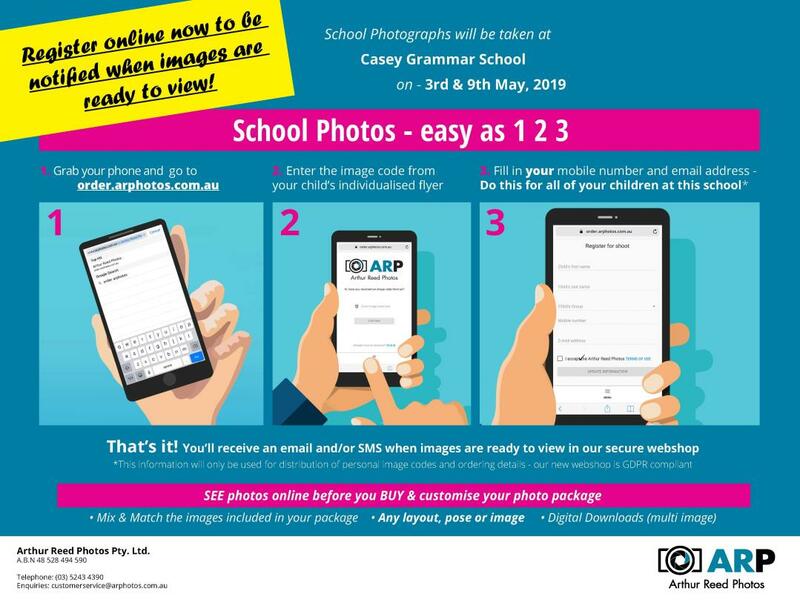 This year we have secured School Photographs with Arthur Reed Photos they will attend over two photo days: Friday 3 May for Class/portrait photos for Years Prep-10 plus some sibling photos as time permits & Thursday 9 May for Year 11& 12 class/portrait photos plus sibling photos and portrait photo makeup day for all other year levels. Ordering has changed this year, so you do not need to purchase photos before photo day. Instead you will be able to view and select the images of your child to be included in their photo package in our new web shop. 3. Fill in YOUR mobile number and email address. Do this for all of your children at this school. In the web shop you can MIX & MATCH the images included in your package; Choose ANY layout, ANY pose or image and purchase Multiple image digital downloads. 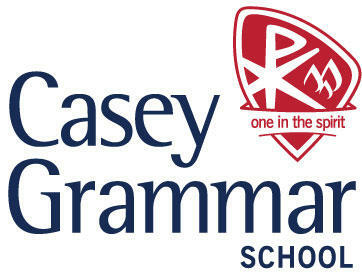 Casey Grammar School is currently looking for GAT and VCE Exam Supervisors to oversee the conduct and administration of assessments. Supervisors cannot be related to, or associated with any student undertaking a VCE Unit 3 or 4 study, be teaching or tutoring a VCE Unit 3 or 4 student or be related to any person engaged in teaching, tutoring or coaching VCE students. Supervisors must be available for both the GAT in June and final VCE exams in Term 4. To register your interest, please email Katie Holley at k.holley@caseygrammar.vic.edu.au by Friday 19 April. The beginning of Term 2 also marks the changeover from Summer to Winter uniform. Please ensure your child has the correct winter uniform as per the schools uniform policy.